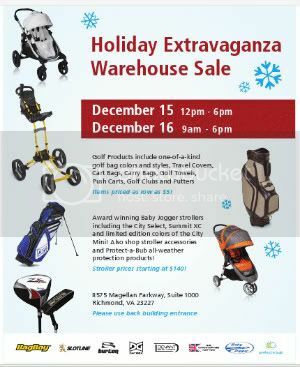 Baby Jogger‘s annual winter warehouse sale is coming up on December 4-5 from 8:30am to 6:00pm both days. Shoppers should drive around to the back of the building to park and for the sale and there’s an additional 10% discount for cash payments. Dynamic Brands will hold a Holiday Extravaganza Warehouse Sale on December 15 (12-6pm) and 16 (9am-6pm). The sale will mostly be comprised of golfing and baby stroller items. Golf Products include one-of-a-kind golf bag colors and styles, Travel Covers, Cart Bags, Carry Bags, Golf Towels, Push Carts, Golf Clubs and Putters – Items priced as low as $5! Award winning Baby Jogger strollers including the City Select, Summit XC and limited edition colors of the City Mini! Also shop stroller accessories and Protect-a-Bub all-weather protection products! – Stroller prices starting at $140! Founded in 2004, Dynamic Brands is the parent company for a portfolio of premium brand name companies that are committed to the development of innovative, quality products and outstanding customer service in the golf and juvenile industries. Golf products offered through the company’s Bag Boy®, Slotline®, Burton®, Datrek®, Devant®, Sir Christopher Hatton®, Miller Golf®, and AMF® Golf brands include walking carts, premium putters, golf bags, travel bags, custom image dyed and embroidered golf towels, bag tags and other golf accessories, and value priced golf clubs. Juvenile products offered through the Baby Jogger™ brand include every day strollers with the only one hand folding system in the industry along with 3-wheel joggers and all-terrain strollers. Protect-A-Bub® produces pediatric recommended sunshades and all-weather comfort juvenile products. Dynamic Brands’ products are marketed in more than 50 countries worldwide.